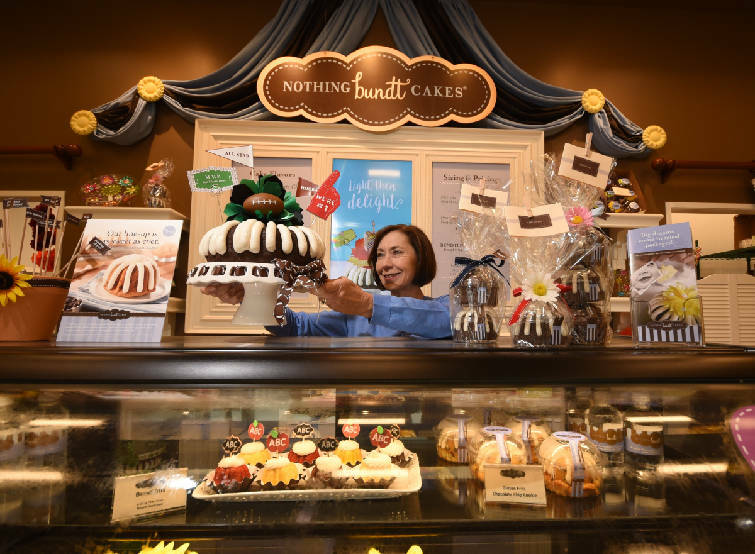 Melinda Mason, owner and operator of Nothing Bundt Cakes, displays a two-tiered Chocolate Chocolate Chip Bundt cake atop the center case at the store near Hamilton Place Mall. 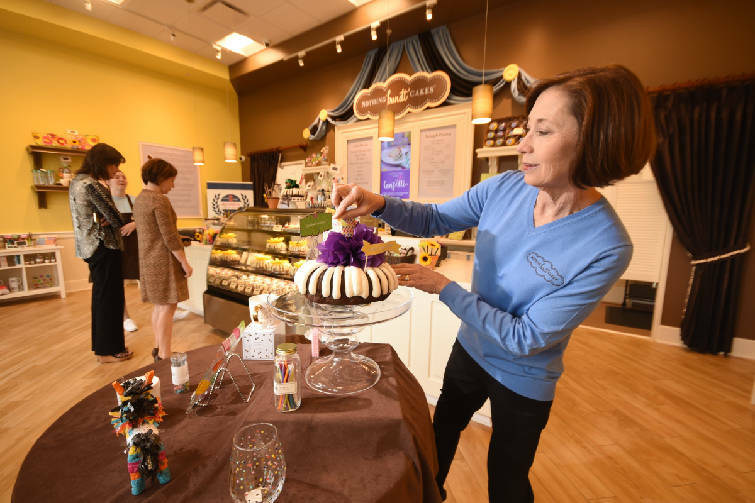 Melinda Mason, owner and operator of Nothing Bundt Cakes, places an M.V.P. decorated Chocolate Chocolate Chip Bundt cake atop the center case at the store near Hamilton Place Mall. Melinda Mason readily admits having the same opinion many people do when they first drive by a Nothing Bundt Cakes store. "Who would open a store that does just bundt cakes?" she says of her initial reaction after driving by one in Southlake, Texas, where she lived at the time. Once she and her husband stopped in for a Bundtini and the occasional Bundtlet, both smaller versions of the full-size cakes, she began to understand that this was a different kind of cake store. After two of her special-education students got jobs at the franchise there in Southlake, it was part of her role as their teacher to job-coach them. It was then that she realized that not only were the cakes good, but the business model was just as appealing. "I got to see the whole operation," Mason says. 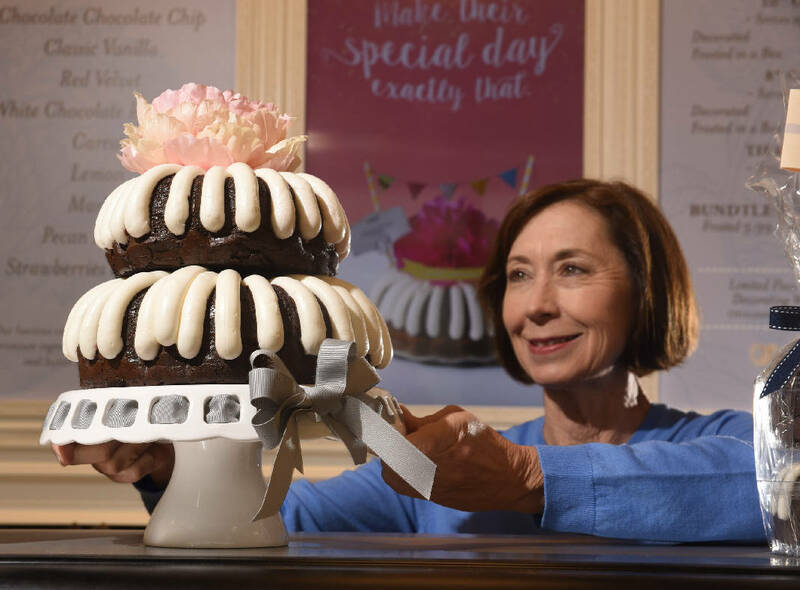 She was so impressed, she soon contacted the home office in Dallas, applied for a franchise, took retirement from her teaching job and began scouting for a location to open her own Nothing Bundt Cakes store. She chose Chattanooga because she and her husband love the outdoors and she has family in West Tennessee. Her store next to Ruth's Chris off Shallowford Road is the first Nothing Bundt Cakes in Chattanooga and the sixth in Tennessee. Her husband, a vice president with a chemical company in Texas, has remained there and makes the commute when he can. "That's how much we believe in it," she says. She opened the store a month ago and has been thrilled with the reception. "We are already getting quite a few repeat customers," she says. Melinda Mason, owner and operator of Nothing Bundt Cakes, holds a 10-inch lemon Bundt cake at the store near Hamilton Place Mall. Nothing Bundt Cakes specializes in bundt cakes, obviously, but the cakes are quite a bit different than the one your grandmother trotted out for the church social. These are fall-apart moist, and all are topped with the same signature cream cheese frosting that is made on the spot. All of the larger items have the same thick, signature icing — the company calls it a petal pattern — dripped over the cakes. A drizzle frosting is available for a lighter touch. Recipes use real eggs, butter and cream cheese. "They are really good," said customer Eric Taylor after trying a lemon Bundtini. The cakes come in 10 flavors — red velvet, chocolate chocolate chip, lemon, white chocolate raspberry, marble, carrot, classic vanilla, strawberries and cream, pecan praline and a seasonal option such as pumpkin spice, chocolate turtle, mocha or pineapple. The cakes might be the main draw, but the store also specializes in gifts for special events with the cake as the centerpiece. The 1,900-square-foot shop is filled with decorations that can be paired with the cake to create a birthday or wedding gift. Corporate and holiday gifts are also a big selling point for the store. "We try to offer something a little different," Mason says. The company originated in Las Vegas in 1997 after two home cooks, Dena Tripp and Debbie Shwetz, joined forces to make cakes for family and friends. Their side project quickly developed into a business that has grown to about 240 locations in the U.S. and Canada. Melinda Mason, owner and operator of Nothing Bundt Cakes, decorates a Delicious Wishes Chocolate Chocolate Chip Bundt cake on a display case at the store near Hamilton Place Mall. Nothing Bundt Cakes has prepared cakes ready for walk-ins, and Mason says they can make gift cakes on the spot while you wait. They have catalogs with pictures of their specialty cakes, and items such as ribbons, gift cards and decorations for weddings, birthdays, sporting events and the like are stocked on display shelves throughout the lobby. "We can have most things ready within 20 minutes," Mason says. She does advise calling ahead for very large orders, but says they could handle a walk-up order as large as 12 dozen Bundtinis. The gift cakes, which are about the size of a big cupcake, start at $7.